Sprinkles help me focus on what’s cool & good and forget what’s not. Sprinkles are going to be my new summertime pal. Every year I seem to forget how summer time can zap my spirit. Even worse, I forget how to KEEP it from zapping my spirit. I posted about this dance last year . This year, sprinkles are my summer survival sisters. I’m going to keep a container of them kitchen counter. So I’ll remember to choose if I want to be miserable or if I want to chill out, let it be and celebrate what’s in front of me. Sprinkles are my new symbol of hope. 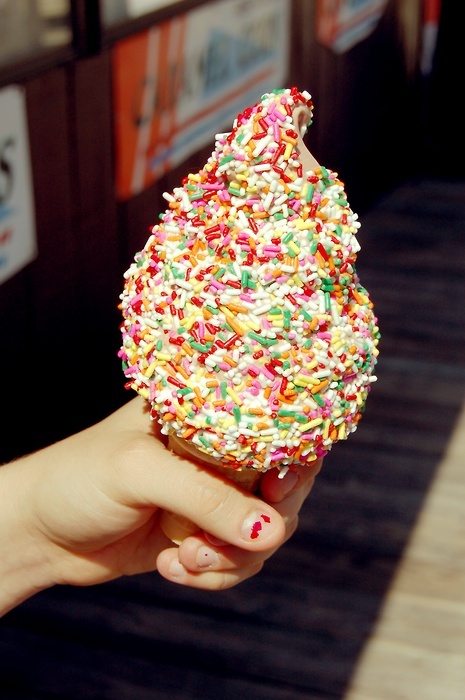 What are your sprinkles this summer? My 4-month-old granddaughter, Adaline. NOTHING else matters when I am with her. I’m with you, Lisa, about summer. And this one is starting out unpleasantly in NC. Thank God for AC! My beautiful flowers-they give me inspiration everyday! I marvel at what different ones are blooming daily ( also marvel at the water bill that it is taking to keep them alive) but they are worth every penny!! They truly are a gift of God! My expected first baby grandson, due Sept. 2nd! He’ll be born in Barcelona, Spain, so thank the Lord for Skype! ooooo Robin, Corrine & Lois, grandchildren and flowers ~ YES! thanks to you all for sharing your HOPE.